Here at Senior Marketing Specialists, we care about every aspect of your business! That means making sure our agents have resources to be successful online as well as in appointments. It’s easy to get lost in the amount of content on social media sites such as Facebook. 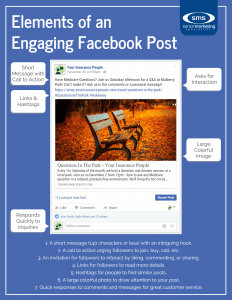 To brush up on your post composition, take a look at elements of an engaging Facebook post below! You have an incredibly short amount of time to capture the attention of a prospective client. Think about how many posts one is capable of scrolling past with the flick of a finger. If you want to contend with all the other content on their news feed, shorter is better. Try to stick to 140 characters or less and seriously consider revising if your post sports a “see more” message. Chances are very few people will want to see more. It’s important to give your audience something to do with the information you just presented them. Whether you prompt them to call you, share your post, or visit your website, what’s crucial is that you give them the next step. Even if they don’t turn into a client, they may learn something or create a client out of someone else simply by following your call to action. Links and hashtags help improve your call to action results. If you are asking someone to visit a website, the best thing to do is put the link directly in your message! Don’t worry about making the link fit your 14o character limit since the color difference helps break up the text. Additionally, using a hashtag (A word or cluster of words preceded by a pound sign) will help users discover similar content. The best way to utilize a hashtag is to come up with one that is unique to your business, or a recurring topic you post about, and use it in many if not all your posts. Social networking sites are just that, a place for people to share and connect with others. 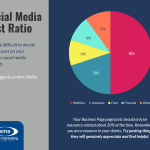 It’s not enough to simply put content out and expect followers to like, share, and comment on your posts. You have to ask them to do it! This doesn’t mean adding, “Like this!” to every post, either. It works better if you get creative. The example above told people to put their questions in the comments, which works well. 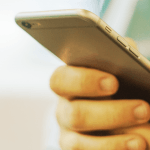 Other successful ways to ask for interaction are asking people to caption a photo, having a raffle with the names of the people who like your post, posting a fill-in-the-blank message, and more! Nothing will help your post get noticed more than a good quality color photo or image. You can take your own, create an image on your computer, or use a picture from a royalty free photo site. It’s important to make sure your picture is relevant to your post and that it isn’t blurry, but other than that, get creative! While this isn’t part of your initial post, it becomes integral to your post’s success as well as the satisfaction of your followers. If you get asked a question or someone makes a comment (positive or negative), make sure to acknowledge it! We know you aren’t able to do so within minutes, but the quicker the better. It’s better to respond to a missed message a couple days late than not at all. Engaging with your followers will boost their perception of you and give your business a warmer, more personable appearance. With these quick adjustments, you will be well on your way to writing a more engaging Facebook post. 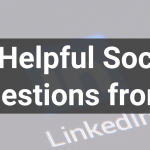 Like the Senior Marketing Specialists page to start a conversation about your social media questions and successes!